The place to keep a VHF radio, cellular phone or flares is in your PFD pocket, a fanny pack worn round your waist, a deck bag or possibly under a day hatch. Anyplace else and you may have to take off a main hatch cover or your sprayskirt during an emergency at sea. Not a bad way to call for outside help - as long as you can get a signal. If you are going to a wild coast, take your cell phone and a VHF radio. There is an excellent chance that you will be able to call for help using one of them, even from a remote island. If you can't get a signal, kayak to a different location or land on a beach and climb a hill. Satellite phones (satphones) can get a signal anyplace but are expensive to buy, and there is a fairly expensive annual subscription. See also Satellite Personal Tracker, below. In the USA you can dial 911, but first try dialing *24 or *CG for direct access to the Coast Guard. 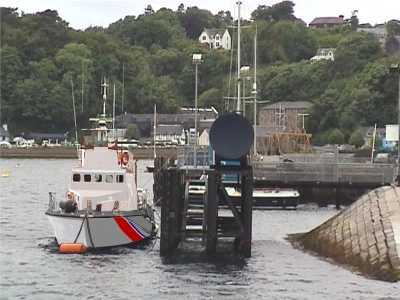 The Adventure Activities Licensing Authority says there have been problems with automated systems which analyze cell phone calls to the emergency services and advise the Coast Guard, lifeboat or ambulance of the caller's location. "It appears that the system that relays the mobile phone signal indicates the general location of the caller. This information is used to alert the emergency services. Unfortunately, the relay information can be significantly different from the actual location of the caller." — 121.5 MHz which is no longer picked up by satellites but is still useful to search teams. Compared to VHF radio, 406 MHz has the advantage that a distress signal can be picked up by commercial and military aircraft and satellites. The problem is that a small EPIRB cannot send a message, other than its location if it has a GPS function. It just has an on-off button. After pressing it, you will not know if anybody has heard your alarm until help arrives. A satellite should pick up the signal within 45 minutes but false alarms are so frequent that in some areas the emergency services may take no action for a day or more. If you think your EPIRB may have gone off accidentally, tell the Coast Guard as soon as you can. A product which used satellite communications to send a short distress signal, giving your identity and location, would be the answer to the whole "distress signal" problem - as long as it told you whether the message had been safely received. Otherwise you won't know whether to wait for help, or carry on trying to reach safety. The SPOT Satellite Personal Tracker looks bit like a Blackberry but orange and with only four buttons. 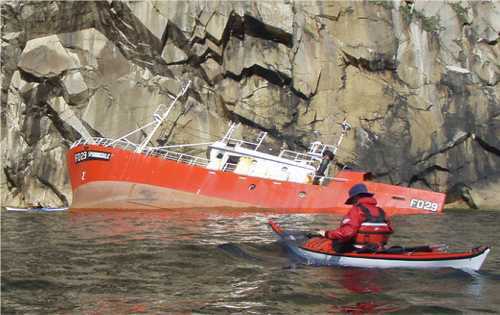 It uses GPS and satellite communications to enable friends ashore to track the progress of an expedition. It also enables kayakers afloat to send a pre-set message calling for help or to check in with friends at agreed intervals. Apparently you can specify your location and indicate whether it is a real emergency or just a request to be met by friends. Competitors in some events such as the Yukon 1000 race and the 1200-mile Ultimate Florida Challenge are required to carry SPOT units. We don't think a SPOT tells the user whether the distress message has been safely received. We did put that question to the SPOT sales team, who responded without actually giving an answer. When we repeated the question they didn't respond at all. We'll take that as a "no". A SPOT unit costs less to buy than some VHF radios and most EPIRBs. The big cost is for an annual subscription for the message-forwarding service, which is privately run. As seen on the floating body of Matt Damon in the opening moments of The Bourne Identity. Usually a cylinder about 8 inches long with a yellow or orange body and a transparent tip. Sold by dive stores and marine supply stores to wear on your PFD, they have a battery and either a xenon-filled bulb or an array of LEDs to produce a very bright light which flashes about 60 times per minute. 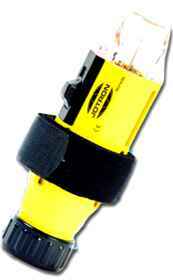 For good quality and a very bright light consider the Tektite Strobe 200 or the Jotron AQ4 (illustrated). Not for use except as a distress signal. Very useful if somebody is already looking for you in the right place at night. Otherwise the light will not be seen, or will be taken for a navigation buoy or fishing buoy. Flares are either hand-held (smoke or light) or aerial (with or without a parachute to keep them visible for longer). They are expensive, don't generally have a truly waterproof casing, and have a three-year shelf life. We recall reading a poll of sea kayakers who tried firing their three-year-old flares during big fireworks displays. About half of them failed to go off. It is customary for sea kayaking books to recommend that they be carried on advanced trips. For our definition of "advanced", see Formal Navigation For Advanced Trips. French law requires sea kayakers going more than 2 nautical miles from shelter to carry three red hand flares. A group of six kayakers on an expedition to a wilderness area might reasonably carry four red hand flares, two orange smoke flares and four red parachute flares. This combination is popular with yachtsmen going more than 7 miles offshore, and is often available as a pack inside a bucket-sized waterproof canister. Also, a pack of Skyblazer pencil flares or Miniflares. Below is a nine-pack, which easily fits into a pocket and includes a pen-sized launcher. All pyrotechnics have a plus or minus. Smoke flares are easy to see in daytime unless it is very windy, but invisible at night. Red flares are hard to see on a sunny day. Hand flares have a long burn time but if they are held only 3 feet above sea level they are not easy to see from a boat or a low-lying shore. Pencil flares don't produce a very big or long-lasting display. Flare pistols and pencil flares are illegal in many countries. Parachute flares are very bright, burn for a long time and can be seen from a long way off, unless it is a day of low cloud when they may just disappear into the cloud-base. They have enough kick (recoil) to make the handle punch a hole through your front deck and they make helicopter crews nervous. You can see fireworks at any time of year and only the context will tell an onlooker whether (s)he has just seen a firework or a distress flare. You may have to set off three or four flares before anybody watching decides to do something about it. A flare is much more likely to be seen and reported if the light is accompanied by a bang. We know a sailor who sent up a big red parachute flare about 500 yards from a crowded vacation beach. The lookout on a ship five miles away saw it, checked the bearing with a compass and reported it to the Coast Guard, who notified the beach lifeguard. Nobody else saw it. Or at least, nobody reported it. Flares must be kept where you can easily reach them at sea, which means in your PFD, or in a deck bag, or in a small watertight compartment which you can safely open at sea. To keep your flares dry, you could carry them inside a rigid waterproof box but this takes up a lot of space so a drybag may be better. 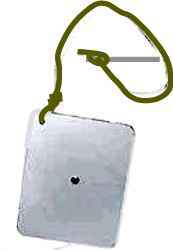 Some specialist sea kayaking suppliers sell waterproof plastic sleeves which slip over individual flares. You are probably carrying a large orange plastic survival bag. On land, you can spread it out and weight it down with rocks to attract attention. At sea, you can inflate it and hold it with the neck underwater. Not only will it help keep you afloat, it will also be an orange buoy more than 6 feet high. There does not seem to be any truly international standard for visual signs meaning "I require assistance". The US and Canadian Coast Guard specify a square of fluorescent orange fabric marked with a black square and black ball which make an ! exclamation mark. It can be stretched out on a beach or hillside and weighted down with rocks. You can easily make a flag 8 feet square from orange ripstop nylon fabric, which is readily available by mail order. See Retail Outlets. It will fold up into a surprisingly small bundle and can weigh less than 50 grammes. Particularly useful if your kayaks are in dark or camouflage colors. Can also be deployed in the water. With the addition of a drawstring, it makes a good group shelter for lunchtime breaks. A small waterproof mirror. On a sunny day you can flash the sun's rays at a passing ship or helicopter. Keep it up for long enough, and somebody may realize that the flashing is not a window randomly catching the sun. Heliographs are quite cheap to buy. The mirror should be at least 5 inches square and of good optical quality. If you can't see your face in it, bright, clear and in perfect detail, it will do a poor job of reflecting sunlight. That describes most stainless steel mirrors. Glass mirrors are much better although prone to break if dropped. Plastic mirrors are lightest but need to be kept in a soft pouch so the surface does not get scratched. For aiming, a signal mirror may have a small hole in the middle and a thin sighting rod, or a built-in optical aiming system. This is used by the pound by drainage engineers looking for leaks and cave explorers wanting to know where an underground stream emerges, and in tiny quantities by physicians to see if your cornea is scratched. Two ounces will dye quite a large patch of sea yellow. Technically it is disodium fluorescein. It will permanently dye natural fibers but is biologically harmless when diluted. 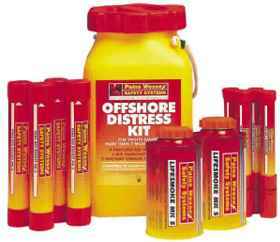 It works best in clear, calm water, very unlike the conditions from which a sea kayaker may need to be rescued. A lifeboat crew will be able to shout their instructions to you, so we will just say a few words about helicopter rescue. A search & rescue (SAR) aircraft can find you by triangulating your position if you transmit with a VHF radio. When it is close enough for you to see, you can help the pilot find you by calling on VHF radio, setting off an orange handheld smoke flare or possibly with a heliograph if it's a sunny day. If you have no VHF radio, the hand signal used at sea to indicate "I require assistance" is both arms straight, raised overhead, lowered and raised slowly and repeatedly. When a SAR aircraft is near your location, do not fire rocket flares. If you shoot down a rescue helicopter, they will probably expect you to pay for it. Make sure that all loose objects are secured, especially survival bags, paddle jacket hoods and other fabric, rope and litter. Being severely whipped by the hood of your own jacket is no fun, and even quite small objects can down a helicopter if they are sucked into its engine air intake. Before a helicopter takes up station overhead, raft up your kayaks because the downdraft from a hovering helicopter can easily knock you flat. See Rafting-Up & Towing. A helicopter just overhead makes enough noise to prevent any conversation. Consider getting the casualty out of his or her kayak so that (s)he is lying across the back deck of the raft. The helicopter winch-man may prefer to pick the casualty up from the water, but there's no need to drop the casualty into the sea until that moment. Don't grab the winch wire. The crew will dip one end into the sea before use, to discharge a jolt of static electricity which is powerful enough to blow your socks off. Don't attach the end of the winch wire to anything. If the casualty is hypothermic, tell the rescue crew. 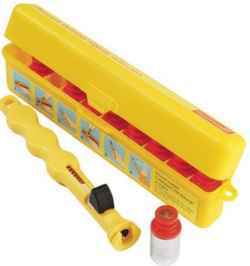 A hypothermic casualty should be lifted horizontally on a stretcher, not vertically in a rescue strop. 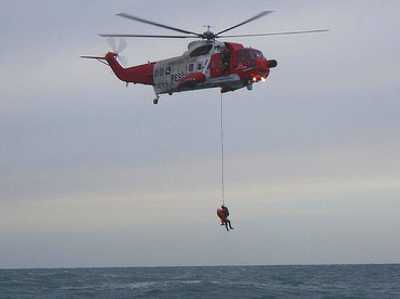 A lifeboat may retrieve the casualty's kayak but a helicopter certainly won't.